Mitsubishi Materials is proud to announce an expansion to the MVX drills - New chipbreakers, grades and just fit sleeves (JFS). A total of 8 new UH – DP8020 inserts. A total of 8 new UN – TF15 inserts. A total of 5 new metric size just fit sleeves (JFS). MVX drill provides excellent economy due to the 4-corner insert design and achieves a high cutting performance as well as long tool life. This is due to the optimum positioning of the outer and inner inserts on the drill body. MVX has also received a favorable reception in the market place for deep hole drilling due to the availability of an L/D=6 version with the same high rigidity body as the standard length version. UH chipbreaker has an reinforced edge combined with the DP8020 (Ti-Al-Si) grade when cutting hardened steels up to 45 HRc or general steels. 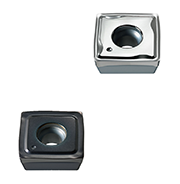 Combination of inserts recommended for hardened steels – 1st choice (inner insert UH-DP8020 and outer insert UM-MC1020), 2nd choice (inner insert UH-DP8020 and outer insert UM-VP15TF). UN chipbreaker provides excellent chip evacuation and smooth rake surfaces prevents welding. Combination of inserts recommended for aluminum – 1st choice (inner insert UN-TF15 and outer insert UN-TF15). UH-DP8020, targets hardened steels up to 45 HRc or general steels. UN-TF15, targets aluminum alloys and any non-ferrous materials. The high strength, negative land edge, together with the durable PVD coated DP8020 grade is suitable for machining hardened steels up to 45HRc, which prevents chipping on the inner insert. The ground and polished finish and peripheral polishing prevent welding and the combination of the positive lands and high rake angles further enhances sharpness is ideal for aluminum or any non-ferrous materials.